Subject: No, City Council Can't Hijack etc. Ms. Irwin - I read your piece in St. Pete Blog. We have a little disagreement here. The City, an “agency” as defined in the CCNA (Section 287.055 Fla. Stat. 2014) has delegated to a selection committee the task of ranking the design teams. On page 14 of the RFQ is the statement of the Stage II Design Concept Process. In paragraph 6 it is stated that: “The Selection Committee will present its final ranking to the Mayor and then to the City Council. City Council will vote to acknowledge the ranking of the Selection Committee and authorize negotiations with the highest ranked Team.” (emphasis supplied by me). That “will vote” language in the final, underlined sentence should not be taken literally. The ranking report will be placed on the Council agenda. Two council members can move and second that Council acknowledge the ranking, or accept the ranking, or accept the report or other equivalent language, and to authorize negotiations, but if the motion does not get a yes vote from a majority (five of eight) of council members, this particular CCNA process has come to an end. The CCNA contains no provision that compels an agency to proceed with a project. It is not reasonable to attribute to the legislature legislative intent to compel a municipality to spend millions of dollars on plans for a project when its governing body has no intent to build it. The CCNA only mandates the procedure for engaging design professionals to provide design services for a project if it is to be built. Early today (3/25) I asked a board certified City, County and Local Government Law lawyer who is very active in this field to read the concluding paragraph of my March 23rd letter to M. J. Connors. In that lawyer’s opinion, a governing body always has the authority to reject a committee report or recommendation. That principle I had picked up by osmosis in my 38 years of actively practicing law. I also had, when whipping out that letter, a strong recollection that the city is now the owner of the submitted design concepts. I found the provision. On page 67 of the RFQ, there is a paragraph 11 titled Ownership and Reuse of Documents which states in the clearest of terms that all documents submitted in response to the RFQ and the ideas incorporated in them “shall become the property of the City” and that the City shall have the right to reuse them. I stand by my March 23rd letter to Mr. Connors. Council can redefine the project, hopefully with greater specificity, incorporating ideas from the concepts it now owns. A new CCNA RFQ can issue. I hope you will reconsider your “Hijack” post. You do write some good stuff. 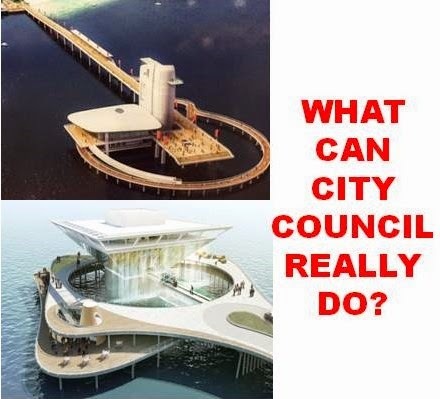 You know, if we did two projects such as redoing the pier much like Destination St. Pete (light fare on the roof top) and got creative on the financing of a restaurant/bar on the uplands as offered by the Alma concept, we would have the critical mass of dining opportunities that the Pier Advisory Task Force recommended in 2010. Isn’t something like that what Lambert Advisory is suggesting in its March 11, 2015 economic benefits report?